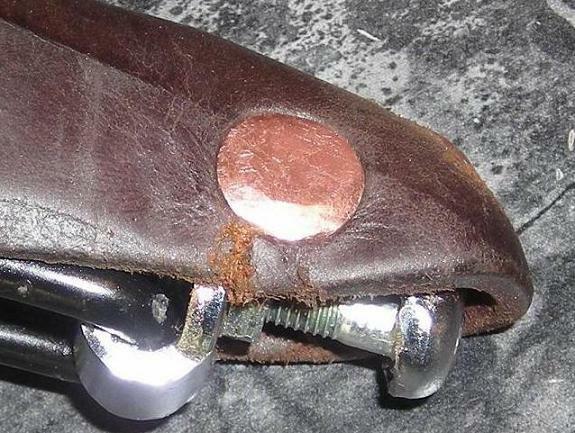 We can repair the METAL PARTS of most leather saddles. 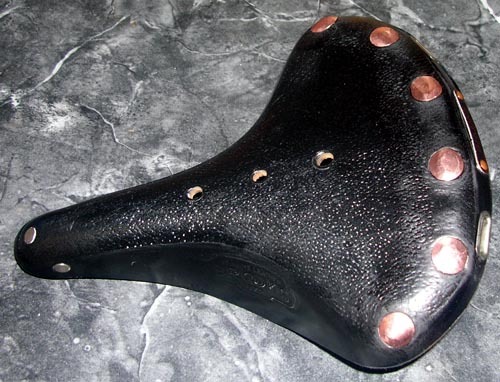 Many non-Brooks brand saddles are clones of Brooks and the parts fit! If the leather is torn, you need a new saddle! 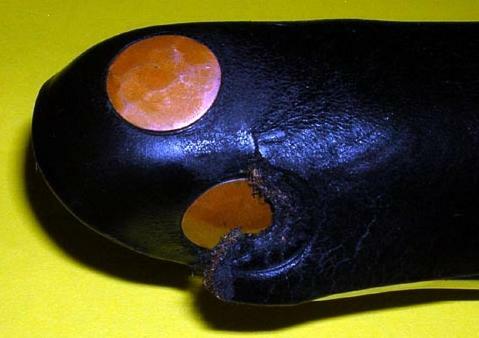 We are not responsible for saddles that tear during repair. Leather is dead cow skin and constant external moisturizing is required. We have fixed hundreds of saddles successfully, but occasionally the leather will tear during the riveting process. Installing new rivets involves using an anvil and a hammer! 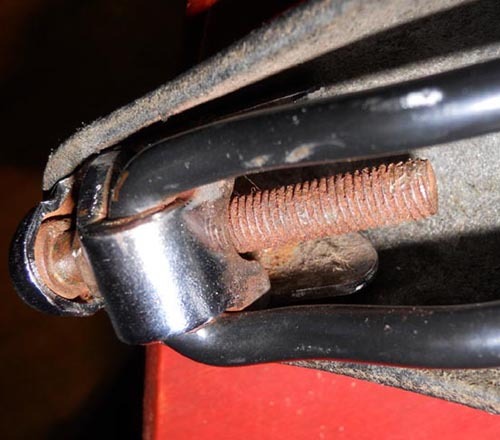 Installing a new nose bolt involves a long lever to stretch the leather and sometimes a hammer. Sometimes the leather will tear during this process. We just never know. WE ONLY ONLY REPLACE RIVETS WITH COPPER (even the steel ones). Send saddles at your own risk! 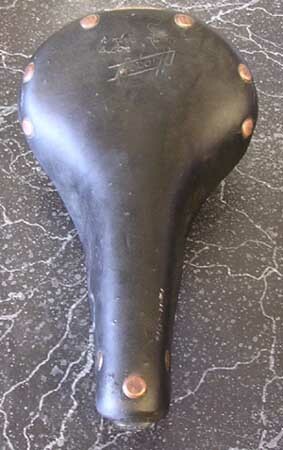 This saddle tore during nose bolt replacement. 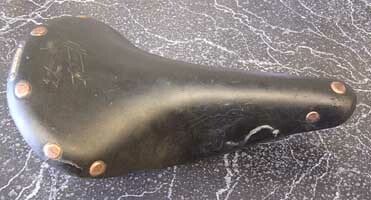 This saddle tore during rivet installation. Leather kept lubricated and moisturized with Proofide or Obeanuf's Heavy Duty LP will not normally tear! If you can see flaky or fuzzy leather, then perhaps your saddle is done. We cannot always see these details from the pictures you send in. The top should be smooth. When you scratch the bottom with your fingernail you should not be able to remove any material and any mark should be minor. If you can dig into the leather and leave a significant mark then the leather is dying. Not all leather is the same and sometimes even dead leather can be restored with oil. We just never know until we start the job. 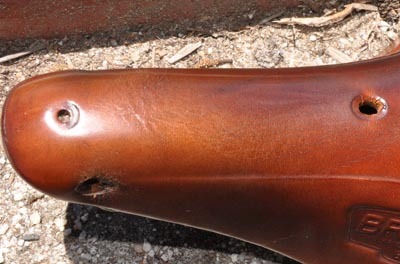 If your saddle leather tears during repair, the minimum charge is $30 which is why we require a deposit to cover our lost time and any installed rivets. 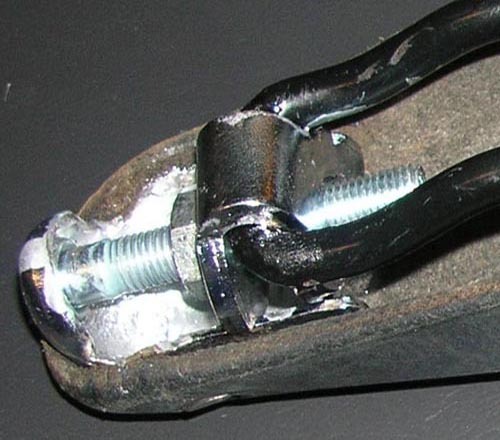 Your dead saddle's metal parts will be recycled and the leather composted! We always oil the repair area and often this will darken the leather. It cannot be avoided so we usually oil the entire saddle to make it look even. Light honey colored saddles, especially will darken. 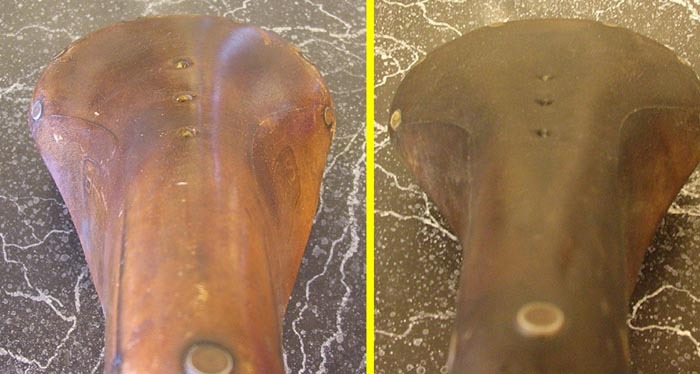 If you would like us to repair your saddle, here is what to do. 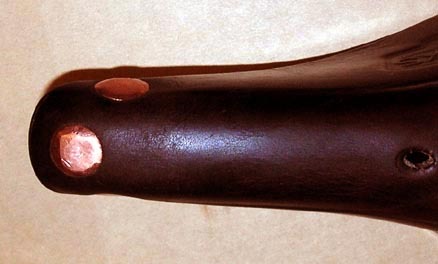 Send us high resolution pictures of the problem and the top and bottom of your saddle (3 picutres total). Wait for us to email you a YES or NO answer. If we respond YES, then send a Paypal payment of $30 to aaron@rideyourbike.com and mail us your saddle. Please note that we will not start work on any saddle without a deposit. When work is complete we will send you an invoice with payment link from Paypal We do not accept credit cards or checks! We only accept Paypal. Prices do not include shipping or tax. Tax is only charged on shipping and labor for out-of-state customers. 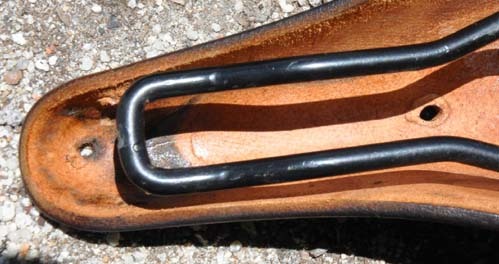 Not all color rails are available for every saddle. You might have to take what you get! Sales tax charged on parts and labor. 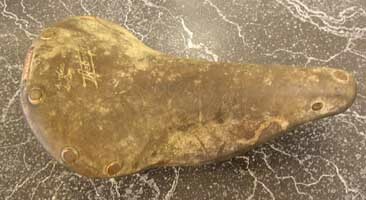 Note: The above saddle after the repair looks dark because it was oiled to make the leather supple during rivet installation. It will lighten over time. DO NOT SEND YOUR SADDLE TO US WITHOUT FIRST EMAILING US! 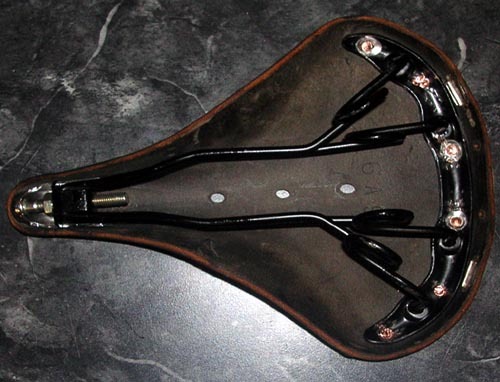 We owe the late, great Val Kleitz eternal gratitude for teaching the rest of us his brooks saddle repair skills. We do NOT sell saddle parts separately. 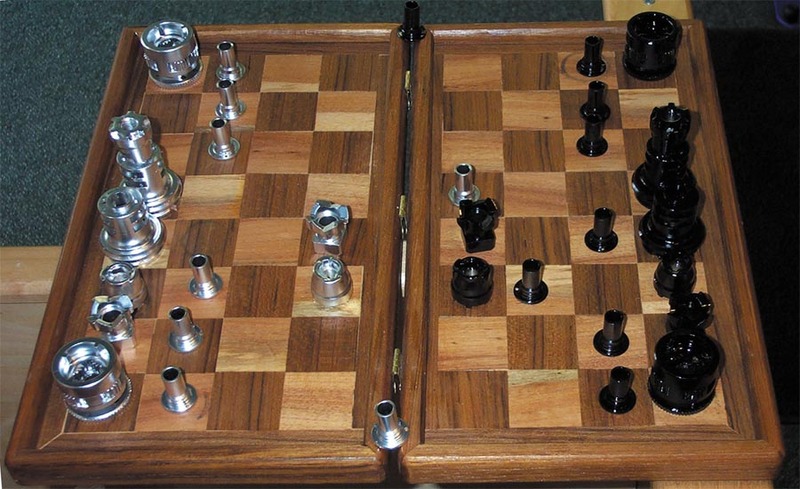 Our stock of rivets and parts are for in-shop repairs only. 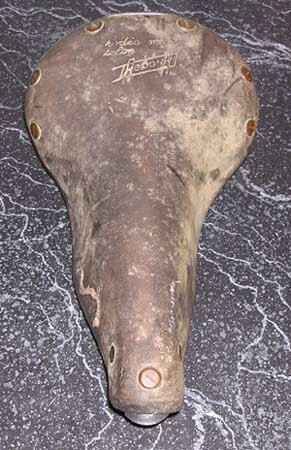 The nose bolt was replaced and the rust on the nose cone was killed with phosphoric acid then painted. 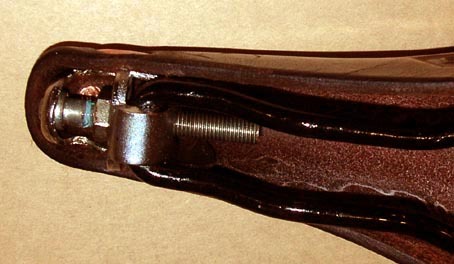 The new bolt threads were greased before installation. A Brooks B-72 repaired with new rails and new copper rivets. 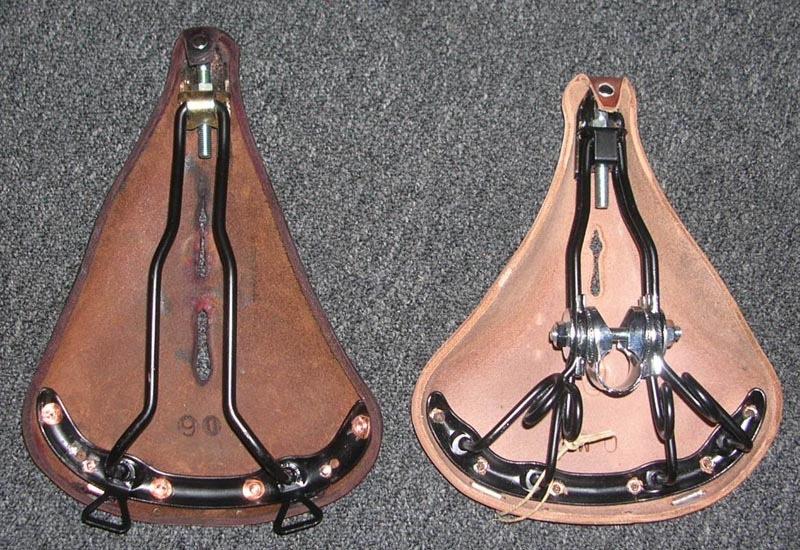 The saddle on the left is a Brooks B-18 repaired with B-68 rails and new copper rivets. Above is a Brooks B-17 Narrow reconditioned and modified with love channel! 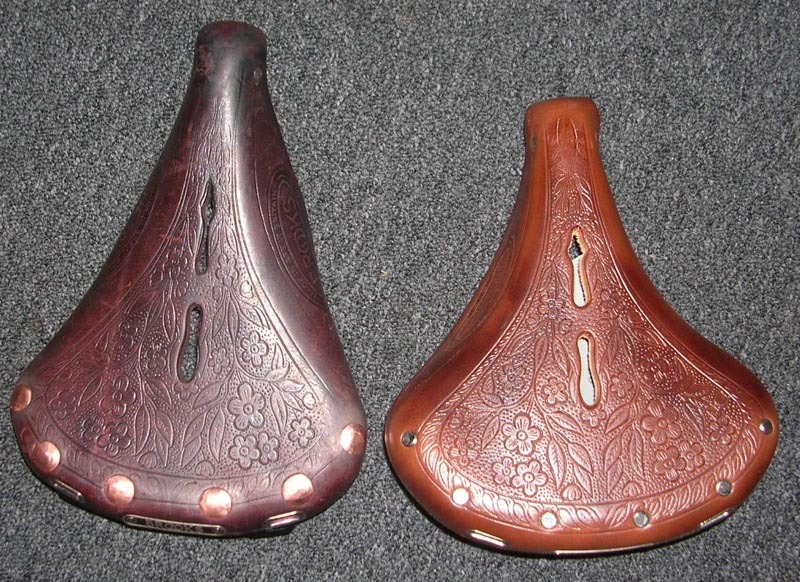 Below are some other brand saddles we have repaired. Many are Brooks copies. Brooks parts even fit! This Fujita Professional is a near exact copy of the Brooks Professional! 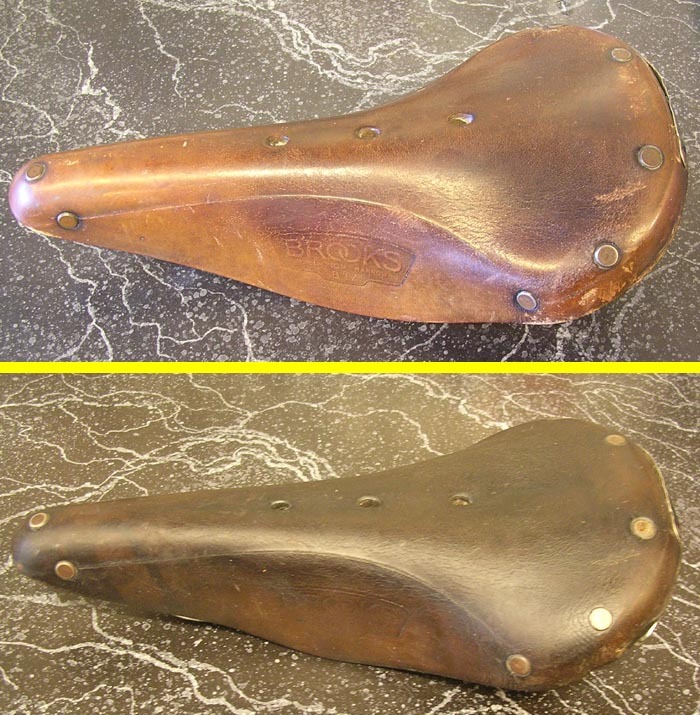 An Ideal Saddle that was reshaped and reconditioned. 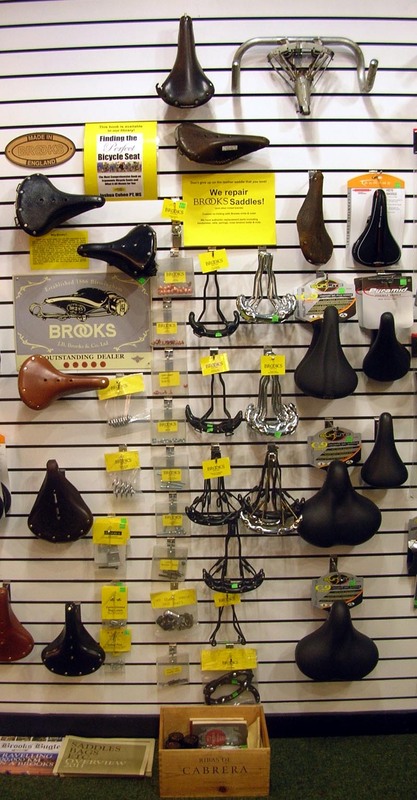 Our stock of Brooks saddle repair parts.